I don’t know about you, but it has been beyond hot here. I have no motivation when the temperatures start to rise. It’s been in the 90’s and suppose to hit 106 later this week. All I can say is OMG, I am going to melt. With all of this heat, one of the last things I feel like doing is cooking, especially in the house. Actually, your pretty lucky if I cook at all, normally when it’s hot like this, all I want to eat is fruit, and drink smoothies. So when the heat is on and simply must cook, might as well cook everything on the grill. Today I have for you a complete, simple, quick meal that is cooked on the grill. It’s actually perfect for serving a crowd or a hungry family. It is my Grilled Steak Fajitas. 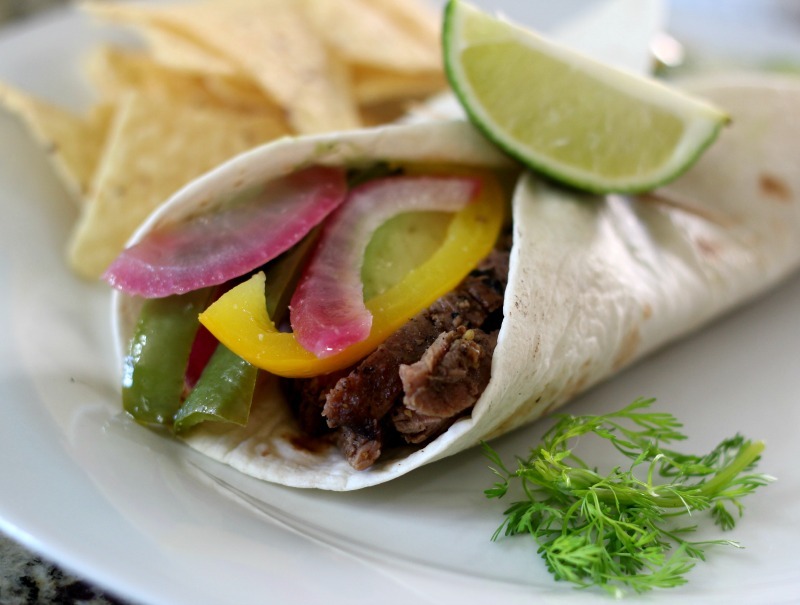 The Steak Fajitas have a nice light lime flavor, and is not real heavy on the seasoning. I wanted to taste everything combined together without hindering the flavors of each ingredient. I am actually loving these fajitas. My Husband who is not a steak fajita fan loved them. That’s coming from a beef enchilada person. I give myself a pat on the back for that one. We have a lot of real Mexican restaurants where I live and as much as I love true Mexican food, I have to admit, I love the Americanized style. I don’t like real heavy tacos or burritos. I like styles that I made for you today. Light, low in calories, low in fat and made with fresh ingredients. You can’t go wrong with that combination. For the meat I used Flank Steak. 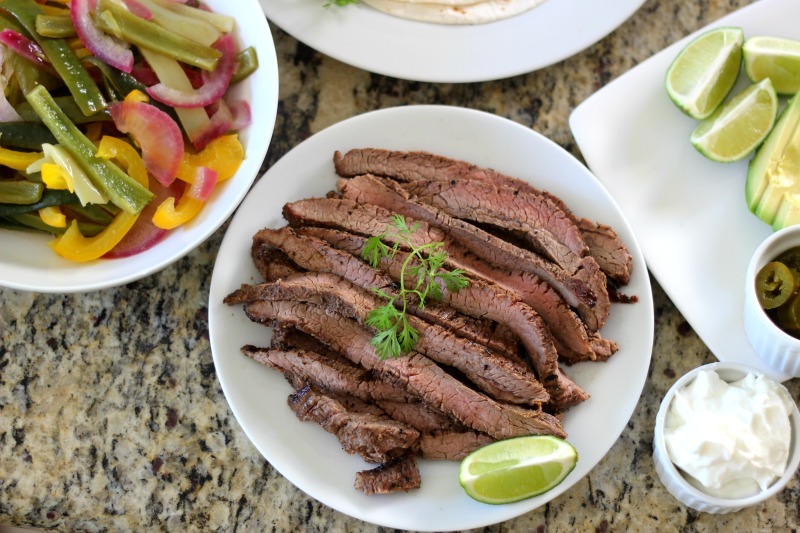 It’s a nice piece of beef that is lean and only 200 calories per 4oz and it cooks fairly fast, and if you marinate it, it wouldn’t be chewy and is perfect for tacos. I marinated the beef for about 4 hours. I used a simple combination of olive oil, lime juice, lime zest, pepper and minced garlic. You can marinate overnight if you would like. Plus if you are going to a picnic and your going to grill, it’s perfect to take a long with you, just be sure it is sealed in its bag. I cooked the Flank Steak for about 7 minutes per side. My beef was about an 1″ thick and the center just had a thin pink line through the middle. Cover it with foil to rest for five minutes, then cut it against the grain into thin strips. While my grill was warming up, I made an aluminum foil packet to place my peppers in. I used sweet peppers from my garden, along with a poblano pepper. Oh and of course onions. I seasoned the vegetables with olive oil and lime juice. I sealed the packet and placed it over medium-low heat on the grill. At that time, I placed the beef on the grill. Once I cooked for 7 minutes, I checked my vegetables and gave them a mix, then let them cook for about 5 minutes more. At that time the beef was done. When the vegetables and beef were resting, I decide to heat up the flour tortillas on the grill. I just heated each side for about 30 seconds, just to warm them and give them a little grill mark. Watch them, you don’t want them to burn. Once it was all done, I served my fajitas with Greek yogurt in place of sour cream, avocado, pickled jalapenos and hot sauce. The perfect taco if you ask me. I have left overs, so it will be my lunch tomorrow! Yeah!! I learned something new while grocery shopping at Trader Joe’s. I was looking for ripe avocado and they were all over ripe. Honestly I don’t know how TJ’s can sell them like that. Anyway, a customer in the store told me if I pop off the stem and look at the center, if I see brown in color, then the avocado is brown inside. If it is light in color, almost green/yellow, then it is perfect. She dug through the bunch and found one for me. Sure enough, when I cut it open, it was perfectly green inside. Pretty cool trick when you’re looking for ripe avocados. 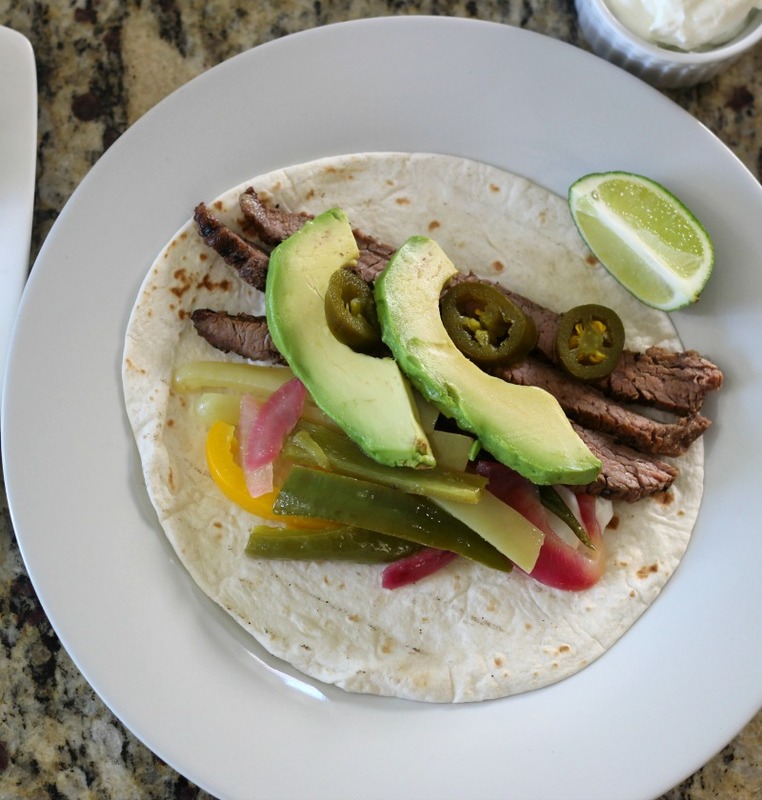 Thinly sliced Grilled Flank Steak that is marinated in a simple lime and garlic sauce, served on a lightly grilled flour tortilla and topped with fresh sweet bell peppers and onion. Make marinade: In a small bowl, mix olive oil, lime juice, lime zest, garlic and ground pepper. Mix until well combined. Add the Flank Steak into a sealable baggie and pour marinade over the beef. Rub the marinade over the beef and place in the refrigerator for at least 4 hours or overnight. 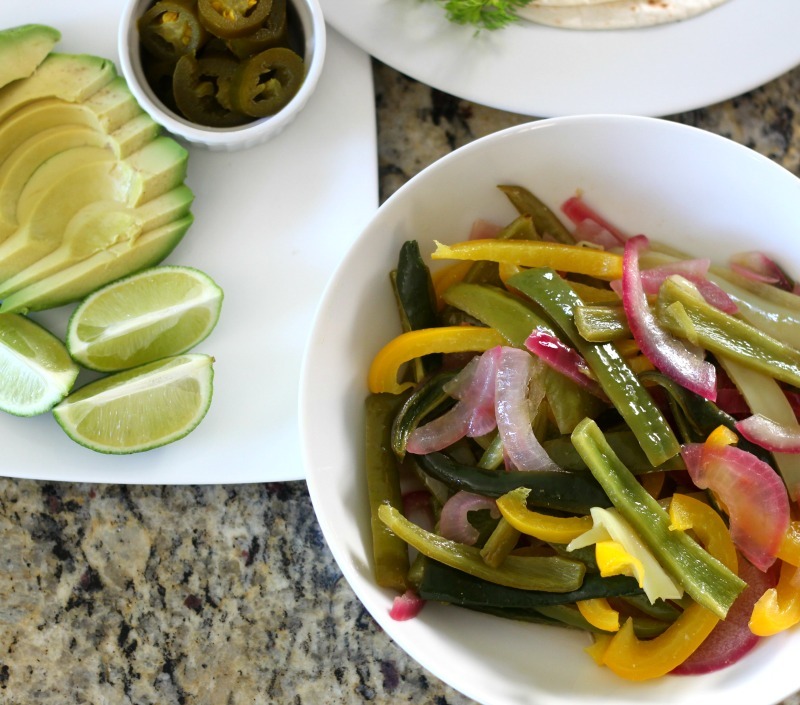 In a bowl, mix together the peppers, onions, ½ tablespoon of olive oil, 1 teaspoon of lime juice, and garlic powder. Create an aluminum foil packet by taking a large piece of heavy duty aluminum foil, about a 9 x 13 size, it doesn't have to be perfect. Add the vegetables to the center and seal up the sides and top of the packet. Just be sure it is sealed. Place on the grill and cook for 5 minutes, open it up and give it a light stir and cook for about 5 minutes more, depending on how crunchy you like your vegetables. 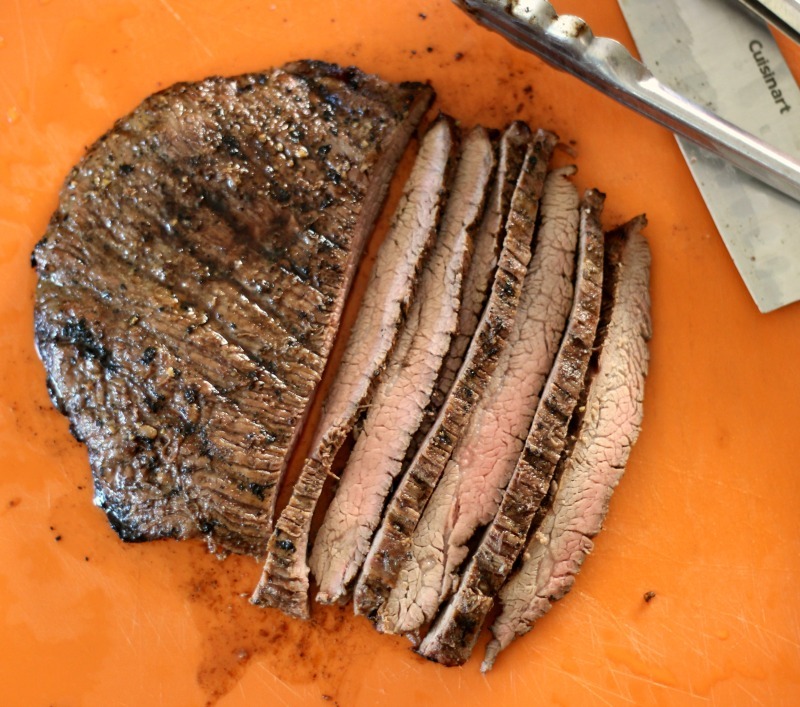 At the same time you put the vegetables on the grill, add the Flank Steak (discard marinade) to the grill and cook for about 7-8 minutes on one side, flip and cook the other side for 5-6 minutes more. 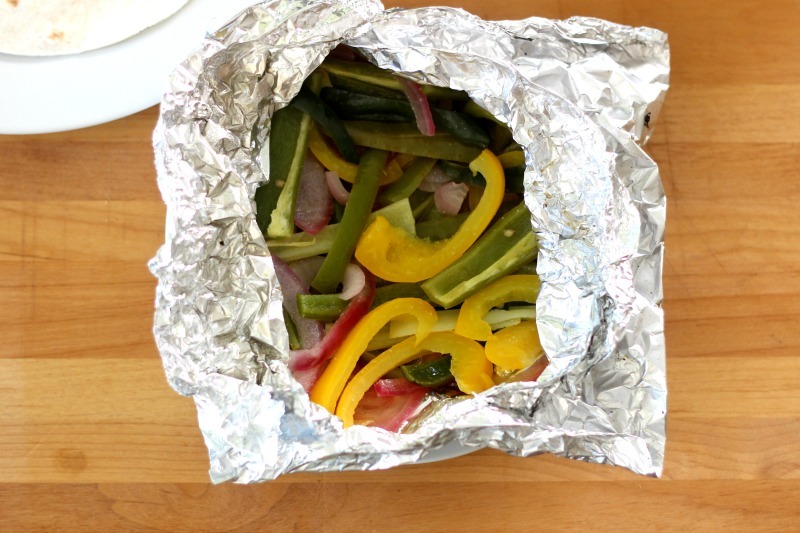 Take off the grill and cover with aluminum foil to rest for 5 minutes. Once it has rested, cut into thin slices. Be sure to cut against the grain. Take the flour tortillas and place on the grill for about 30 seconds per side. Just to warm them up. My Calorie calculator is not working. I added this to my Fit Bit and it is roughly 250 calories per taco. 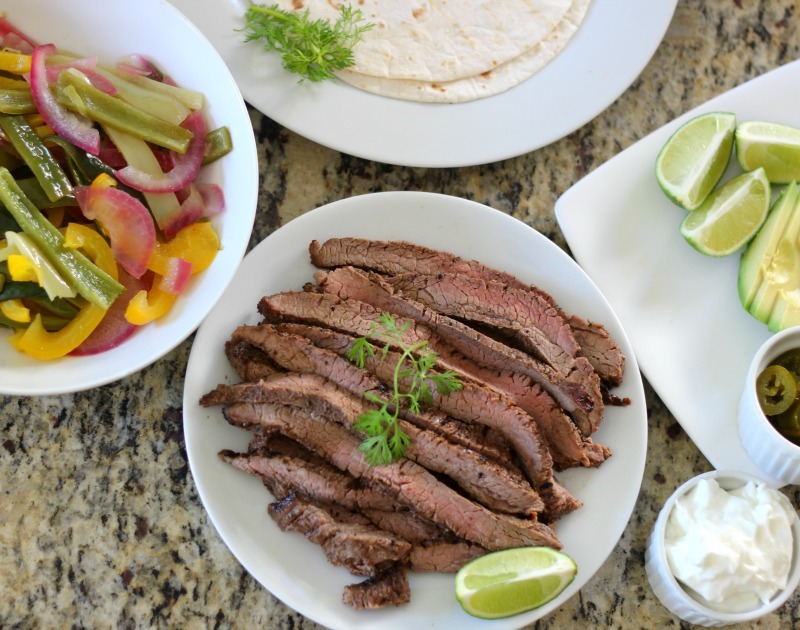 Each tortilla was 110 calories, Flank Steak 100 calories (2 oz), peppers about 40 calories.